When I hear the term “FIRE PROOF SAFES” I cringe, I feel I must correct the term, no such thing exists. Don’t get me wrong, there are “FIRE RESISTANT SAFES” and they come in many types. The term fire resistant is defined by the testing procedure where a safe is exposed to high temperatures and tested to see how long it takes to get to a specified temperature. There are two main categories. 1 tested for paper products and 2 tested for data products. The first type of fireproof safe is the standard variety. 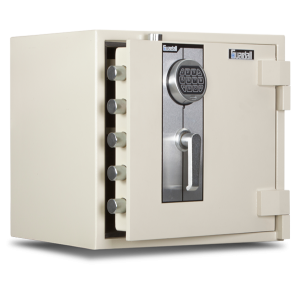 There are a many different types of fire proof safes, sorry, fire resistant safes on the market, they are standard types which offer good security as well as fire protection, and these are generally the more expensive and better quality safes. Then there are the safes offering basic security, often very thin metal on the door and casing, filled with a “fluffy” type of cementatious product to give the fire resistance, and finally there are DATA type fire resistant safes, these are specifically designed for protection of fragile data storage devices, photographic mediums and other items that must be kept at below approximately 50 degrees C.
When looking for fire proof safes, sorry that mistake again, fire resistant safes you have to take into consideration what you want to store, ideally you would be able to select a high security 1 hour fire tested safe large enough to accept what is called a data storage case, this offers the combination of the best of both types and means in the unfortunate event of a fire you are covered. Always check the thickness of the metal in the construction, this will give you a good indication of what level of security, as mentioned earlier, there are out in the market manufacturers who claim “Fire Proof Safes” these are generally the ones with the thin metal casing filled with the “fluffy” cement/gypsum product, they do offer good fire resistance but are low on the security level and always make sure that whoever you buy your safe from can offer a full backup and support service including spare parts.